Rapidly rising Seattle roots rock band Cody Beebe and the Crooks return home after a successful two-month tour of the Western US to headline the Crocodile Café on Saturday, April 23rd. In addition to their muscular, energetic and always entertaining live show they’ll also offer a “sneak peek” of the music video for their recession anthem “Nine to Chain”. The video, produced by Fueled Creative, was described by the band as “like a thick stout” due to the subject matter. It will strike a chord with many affected by the recession. 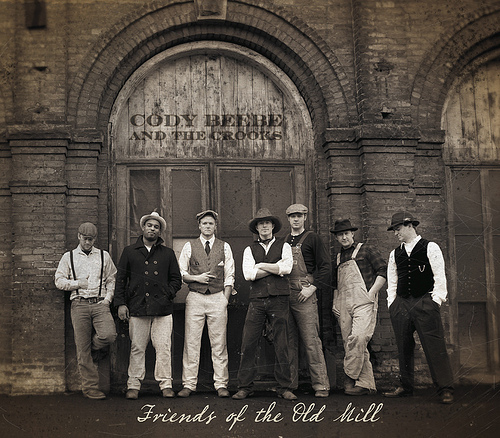 The two-month tour found Cody Beebe and the Crooks playing their first SXSW festival, headlining Mardi Gras in Galveston, Texas and meeting the legendary Stevie Nicks. They’re now back home in Seattle for a couple months gearing up for an exciting and extensive summer schedule including a radio campaign for their single “Waiting On You,” the official release of their “Nine to Chain” music video and a tour that will crisscross the United States. Supporting Cody Beebe and the Crooks at the Crocodile will be Austin Jenckes and the First Call from Bellingham, River Giant from Seattle and UW grad/Los Angeles-based singer/songwriter Daniel Kamas. This will be a fantastic night of local music not to be missed. Written by: Chris Senn on 04/15/2011. Last revised by: Dagmar, our reviewer, on 04/16/2011. This entry was tagged austin jenckes and the first call, by Chris Senn, Cody Beebe and The Crooks, daniel kamas, river giant, the crocodile. Bookmark the permalink. Buddy, The show was amazing!! I can’t believe how far you guys have come from singing at The Coug in Pullman, to seeing you on stage. For those who have not experienced this amazing phenom, I highly recommend checking them out. This band brings an energy that gets your foot tapping and hips swinging, look out Dave! Again, congrats, I can’t wait to hear about your next adventure and I’ll see you at your next show.